We are going to provide you the Educators teachers jobs 2018 NTS Test Islamiat Studies Online Mcqs for preparation Science & Arts Teachers ESE SESE SSE. You Just Attempt the Test with simply click on Start button and then your time will be start. So these test will help you as a Sample Tests. 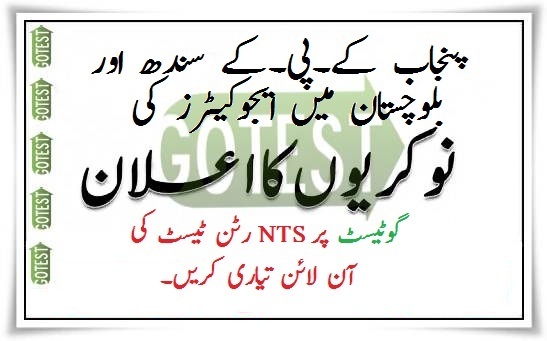 Because all such tests are going to publish according to the NTS Test Criteria Subject and Topic Wise detail as well. The NTS Islamiat Studies Test Preparation Online is provided online at your Home door step. The Education Department has assigned the recruitment responsibility to National Testing Service Pakistan in order to meet transparency throughout the process as well. Preparation is being given as Online NTS Test Islamiat Studies Subject with all topics according to current NTS Criteria by gotest.pk. Candidates face numerous Issues to prepare their NTS test here is the one of the Easiest and best way that is less time consuming and free of cost and major thing is that its on your Door step. Currently, Educators teacher jobs are the vital attention for everyone as it covers alot of benefits regrading career of anyone. Above mentioned quizzes are very significant with respect to its applicability and validity as well.Just attempt and start the quizz session in order to produce desired results as well.